I don't know about you, but I can't seem to get enough of do-it-yourself, public-land land hunts no matter where they unfold. 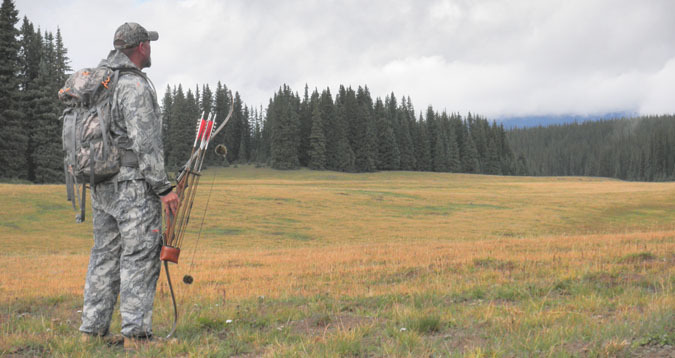 But if this Midwest-raised bowhunter had to choose, the pristine high country of the West offers a unique attraction that's hard to top. 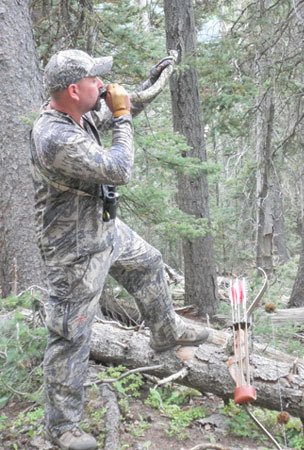 Especially in September—when mighty bull elk bugles tend to ring out regularly from isolated peaks and timbered valleys near and far. 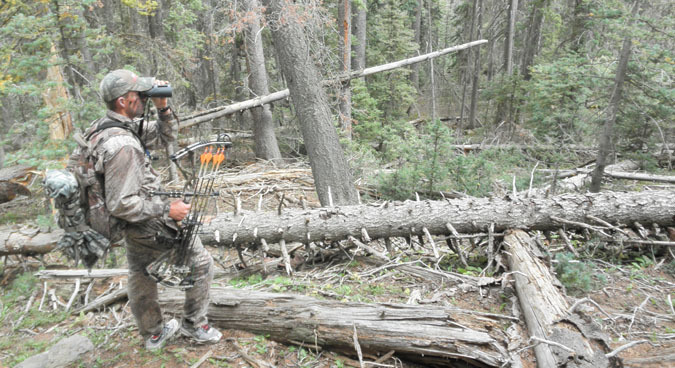 This year my elk hunt unfolded in Colorado, in the scenic Rio Grande National Forest in the state's southwest corner. After the 18-some-hour drive in from Minneapolis, the nearby riffles of the Rio Grande River stirred my flyfishermen's instincts, but I had left the fly gear at home. I was focused on other things—namely those carrying about 750 pounds of rippling muscle, and topped by majestic crowns adorned with six polished antler tips to a side. Once in Colorado I hooked up with two more local, DIY elk nuts—Jace and Ralph, who were sporting an impressive arsenal of brand-new, well-tuned bow gear. 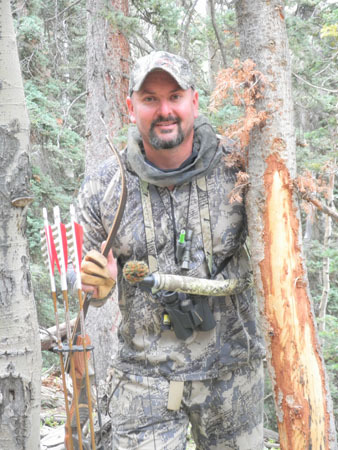 Jace was toting the new Hoyt Carbon Matrix carbon-riser compound, while Ralph carried the newest flagship bow from Mathews Inc., the compact, sweet-shooting Z7. My 58-inch Bob Lee Classic recurve completed our somewhat-eclectic arsenal. The morning dawned chilly and still, with a temp of 31 degrees in our mountain tent-camp. After a quick pre-dawn powwow it was decided I would head up the steep mountain in back of camp, while Ralph and Jace would go their separate ways up an even steeper mountain located immediately to the west. The guys, both veterans of these National Forest hills, had told me about a good bench to check out about halfway up the pine-covered mountain, an area I later found looked prime indeed. I called sporadically, using both cow calls and bugles, but got no responses as the day warmed quickly under bright, sunny skies. I would cut several abandoned (and closed to ATVs) logging roads on the way up, encountering plenty of good-looking aspen-dotted elk country, but the woods remained silent of elk talk. I would descend the mountain in late afternoon after an extended hunt covering several miles, during which no elk talk was heard. The tricky, steep descent required a good two hours of careful trekking that included circumventing several daunting faces of extended sheer-rock dropoffs. Despite my "first day" aches and pains, it felt seriously good to be back in elk country. This morning also dawned chilly, seemingly colder than the 34 degrees registered on our gauge, but also somewhat invigorating. This morning Jace and I would drive a 4x4 pickup to the top of a nearby mountain with a goal of hunting down, but we ran into some good sign, some fresh rubs and droppings, while still on top. The top of the 11,500-foot elevation mountain offered many good-looking parks and meadows, and something even better—a lack of hunter pressure. Find the elk here and things would get interesting fast. Our intermittent bugling and cow talking went unanswered until early afternoon, when we heard what sounded like the bugling of another hunter. In the end, it turned to be just that—we had managed to lure in Ralph, who had also driven up the mountain. Laughing at ourselves for playing out the ruse a little too long, we soon came together to formulate an evening-hunt plan—checking out another nearby mountain for signs of elk that were willing to talk. Hot, sunny conditions continued, with temps in the high 60s that felt closer to 80 degrees at 11,500 feet. The p.m. hunt would pair me and Ralph, while Jace set out alone. After a seriously steep climb we hoped would lead to elk-covered benches, we found just that. As Ralph and I approached one of the best-looking saddles either of us had ever seen, goose bumps literally appeared on my arms, and we looked at each other with knowing grins. "Let's be sure to be quiet so we don't bump anything bedded up here," Ralph hissed to me. It wasn't 30 seconds after those prophetic words escaped Ralph's lips that 4 or 5 elk exploded from their beds not 30 yards away. In our laps! True story. We cowered and nocked arrows as we simultaneously scrambled for cow calls and bugles. In all the fuss we never even glimpsed an elk, all we heard was their thundering hooves pounding away up the mountain. Encouraged by the encounter, we decided to set up in the meadow of the unique natural saddle, and call intermittently. Maybe an hour later, way down below, came a bugle answer. But for some reason it didn't sound right. Another hunter? I also was leery of the location. We had just come up from that area. It just had to be hunter. However, I was wrong. In a few minutes, with evening fast falling, Ralph and I would split up, with Ralph moving toward the bugles while I hunted back the other way, taking a long loop up and then back down the mountain. Ralph, meanwhile, ran into the source of the bugling, a large bull with several cows that he just could not move in on. Then suddenly, it was above him, with night closing fast. Exciting and close, but just no cigar. Exhausted, I slept in as Jace and Ralph returned to the same saddle area and got into three bugling bulls—what the guys determined was the large herd bull with four or five cows that Ralph had encountered the previous evening, along with two more satellite bulls. The morning hunt was a fast one, as the elk quickly got above them, and seemingly kept on going, to the top of the mountain that was more or less a futile chase. The pair were back in camp about 10:30 a.m., bushed but enthusiastic. We all figured the elk would be back in the same general area come evening, and so we fixed a good lunch before returning. To be honest, it was nice to be leading our small group up the mountain, although sleeping in had given me a strong advantage in the strength and vitality department. Jace and Ralph were running, literally, on fumes. Or maybe adrenaline. I didn’t mention that Jace is an ultra-marathoner, someone who delights in running 20, 25, or 30 miles at a clip. For fun. My own elk season cardio preparation is centered largely around biking, but I'll throw in some running as well, though rarely ever more than a few miles at once. Yeah, it was a nice change leading the group up the mountain, but I knew that (this year at least) my preparation wasn't really what it should have been, and that Jace and Ralph would soon have their revenge. (For the record, they got it). Soon after the three of us accessed the familiar good-looking saddle, Ralph peeled off in the direction of his elk encounter the previous evening, while Jace and I hung around and called at the spot for a while. Maybe an hour or so later we drifted toward the direction Ralph had gone; we surmised the lack of his own bugles might have signaled he was chasing a bull or two off somewhere. Turned out it wasn't the case, as the three of us met up sometime later, still waiting to hear the first elk talk of the evening. A bummer to be sure, but we weren't ready to give up. As we descended with the lengthening evening shadows, we eventually broke timber and entered a meadow/clear-cut. Halfway through I glanced to the left to see an unusual tan blob; through my binos I soon made out a cow elk staring us down. She turned to leave and I bugled instantly, hoping she had a suitor. All, however, was silent. A fitting end, I guess, to a somewhat-frustrating day. We were back to square one. A horrible night of sleep saw me praying for dawn. Why? Bitter cold. At least, cold I was unfortunately not prepared for. We awoke to 18 degrees at our approximate 9,500-foot elevation, helped along by clear skies. Overnight, the problem was my 20-degree-rated sleeping bag I had brought along solely for bivy hunting; I had somehow forgotten to pack my 0-degree "base-camp" bag and had paid a dear price because of it, awaking every hour or so despite several layers of clothing. Without necessary sleep I was bushed and so slept in, as did Jace and Ralph, who were really hurting from pushing so hard the previous day. Over a big breakfast of bacon and eggs we hatched a plan to return to the 11,500-foot mountain we had tried previously; got up there about noon with a plan to hunt down to camp. Jace and I had a plan of bugling back and forth to excite the local bulls to join in; we were but a third of the way down when we had an interesting encounter. As we sat to catch our breath and do a little cow talking, we were whispering silently when we soon heard a startling noise. Heavy footfalls were closing in, getting louder and louder. As I jerked my head to the right, a flash of elk caught my eye—only yards away! In the same instant, Jace peered over the edge of the steep embankment below us to glimpse—a cow elk staring at him 3 yards away! In the next instant, as we scrambled to nock arrows, the elk were gone, thundering away to our right just as fast as they had closed. We had seen 5 elk, yet could not determine if the small herd held a bull. Crazy stuff, but a good sign. Especially, for elk to be up and on their feet in early afternoon. We took the herd's lead and began side-hilling left, to the north, cutting their unmistakably fresh tracks several times. Then, after hitting a rocky descent so steep rappelling gear would have been handy, Jace, who was below me, motioned to get down. "A spike bull is right below us," he hissed. As the spike moved on, we descended to the same bench below, and instantly got an eerie feeling. Instantly we encounter a huge, fresh rub, and plenty more smaller rubs, of all degrees of freshness. The place literally reeked of elk. Bingo. We had definitely found an isolated sanctuary. As we’re taking some photos of the sign I hear some footfalls and tell Jace, "Get ready, I hear hooves!" Jace looked at me in disbelief but sure enough, here came several elk from the same direction the spike had snuck away. In the lead was a large cow; trailing somewhere behind was another, and a brown blob I couldn’t make out. "It's a huge bull," whispered Jace, who had a better angle. "A big 6x6." Bracing for action we still couldn't move, as the cow was now almost upon us. About 35 yards up the slope, she fed across a small opening—a path that I could plainly see dead-ended just above us, at the end of a sheer rock wall. From there, her only move would be to turn back or come down—literally right into our laps. A scant 10-yard shot with my recurve. Interesting indeed. I strained to glimpse the trailing bull yet couldn't. As we crouched in anticipation, minutes passed. Curious, and with the cow now behind some tree trunks, I slowly extracted a powder wind checker from my right pocket and squeezed. The powder drifted uphill—more or less right toward the feeding cow. It took a minute and a half, maybe longer than it should have, for her to get our wind and spook, turning back the way she came. We hear 4 or 5 elk in the thick tangle to the north suddenly take a few bounds, and then silence. Immediately our cow calls are answered by unseen elk, and then I force the issue a bit more, squealing a challenge on my bugle while picking up a large branch and springing to a nearby pine tree, raking and breaking its branches for all I'm worth. To my mind, it's no small point that we're standing literally feet from the largest fresh rub we've seen on this mountain, and that it's maker is likely very near. If he's truly the burly 300-class bull Jace witnessed, it's a good bet he won't stand for a challenge in his bedroom. In the end, I'm only partly right. As I pause to better hear incoming footfalls, the silence is deafening. And then we're consumed by the emotion of the moment. Jace is beside himself for getting so close to a whopper bull, again, and blanking. I'm still hopeful, but our excited whispers are getting louder by the second as we both consider the elk have vamoosed. But wait. What was that? Again, I hear incoming footfalls. Can it be? "Get down!" I hiss to Jace, while springing to the right to get a better shot angle. Just as I get set I glimpse Jace spin and come to full draw—as the same lead cow emerges, like a ghost, from a brush tangle just 15 yards away. She's back, likely to check out the new "stud" bull in town. I'd made way too much noise for it to be anything else. The cow is directly facing Jace, while from my "quartering-to" angle to the right, I need her to take one more step for a good shot. Instead, she whirls, and is gone once again—now taking the entire small herd with her. They crash off down the mountain, and this time, we know the game is really over. A cool encounter to be sure, and for both Jace and me it's the first time we've ever called a spooked elk back to just 15 yards. It's a small victory to be sure, but the only one we'll get tonight, and we'll take it without complaint.